In the corresponding Business Value blog #S4HANA 1610 use case series: 1a – new advanced ATP (biz view) we have explained why it is essential to provide customers with requests for information on product availability, and how we will cover the last minute rush order. Today´s blog will shed a light on what has changed with SAP S/4HANA 1610 from a technical point of view to address the key business challenges faced in the order fulfillment process to provide the customers with the available quantities of the requested product and the corresponding due dates for them to expect delivery. And for the records, this has been available in S/4 Cloud with 1608 already. SAP ERP Central Component’s (SAP ECC) Available-to-Promise (ATP) is the order fulfillment process that is designed to provide a commitment to customer-requested order quantities and dates based on availability of products, components, and resources. The Availability check ensures that there are enough components available for planned or production orders in production planning and production control. The Customizing is based on a combination of fields from the Materials Resources Planning (MRP) and Sales and Distribution (SD) views of the Material Master Record, for the most part. User exit on Delivery Proposal screen adds additional location searches. Transportation planning date: Date by which transportation must be arranged so that the delivery can reach the customer on time. Material availability date: Date by which sufficient quantities of the item must be available for picking to begin. The system calculates the material availability date by working backwards from the customer’s requested delivery date, taking into account how much time is needed for delivery-related procedures, such as picking, packing, loading, and transportation. Loading date: Date by which picking and packing must be completed so that the goods are ready for loading and for the delivery to reach the customer on time. Goods issue date: Date on which the goods must physically leave the shipping point to reach the customer on time. Delivery date: The delivery date can be the date requested by the customer, or (if the requested date cannot be met) or the earliest date proposed by the system after automatic availability checks and delivery scheduling. The concept of available to promise used in Sales and Distribution (SD) module in SAP R/3 provides check capabilities that deliver results for basic business scenarios. More complex scenarios, however, require more robust capabilities to make delivery commitments that are in line with the real-world demands. In short, global scenarios require global solutions. SAP’s Advanced Planning & Optimization (SAP APO) Global Available-To-Promise (Global ATP) is implemented to take advantage of several advanced functionalities that standard SAP ECC does not provide, takes advantage of SAP APO technology and picks up where the SAP R/3 ATP solution leaves off. The Global ATP in APO processes are run via SAP live Cache (a tool for processing large volumes of data in main memory, enabling data sharing among several applications), which processes large volumes of data and enables data sharing across several applications. gATP meets the challenge of providing availability information across a global enterprise. As the creation and maintenance of master data are done in the execution system, a data transfer is necessary and any master data changes in order that this master data is available in the planning functions of SAP Advanced Planning and Optimization (SAP APO). The data is transferred via the Core Interface (CIF) and the same master data situation exists in both systems (see Technical Architecture picture). The new advanced ATP (aATP) within SAP S/4HANA 1610 runs entirely on the in-memory platform SAP HANA which has been optimized and improved the overall performance. The internal logic to read the planning elements from the database to the internal table has been fully redesigned to run in-memory planning. In the same way, SAP S/4HANA 1610 use the innovations and the new inventory data model done with SAP S/4HANA, on premise edition 1511 (see 1511 use case blog 2b – next generation inventory management (tech view)). 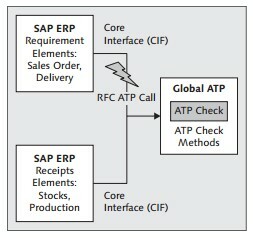 With SAP S/4HANA 1610, we are introducing the advanced ATP integrated into S/4HANA core, and the goal here is clearly not to integrate the gATP in SAP S/4HANA, but to develop a more efficient ATP system supporting this dynamic digital world in which more complex mechanisms are necessary for varied production, variable demand and multiple stock localizations. The all new advanced BOP is based on a multi-step filter & prioritizer. Each pair of filter & prioritizer is called a BOP segment definition and defines a requirement list which is sorted according to a free set of order attributes. All requirements of a given BOP segment have the same semantics which is called confirmation strategy. There are five different predefined confirmation strategies: Win, Gain, Redistribute, Fill and Lose. It is possible to have multiple BOP segments of the same confirmation strategy. Each BOP run is based on a so called BOP variant and needs at least one BOP segment definition but it might have many more. Each requirement which is ATP-checked during the one BOP variant. Additionally the selection can be restricted by a global filter of the BOP variant. Using a global filter means that each individual segment definition can be kept very simple and purely based on parameters which are related to the business meaning of that very segment. In contrast, the global filter is expected to be more technical, defining the relevant material/plant-combination according to their specific attributes or aligned with organizational selection criteria. In this innovation, we modified the way how end-user works with the system. Indeed, the work is facilitated and the user can directly see the material shortage and the end-user can focus its work on what’s wrong. 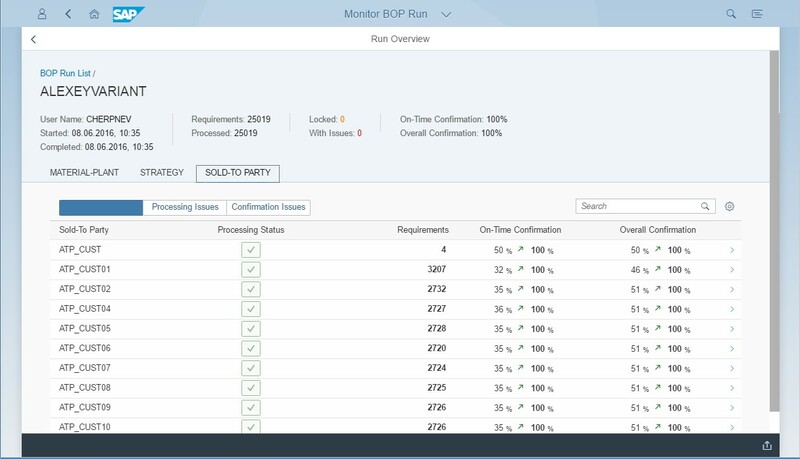 This SAP Fiori app allows the end-user to review critical shortages and the result, to easily gate keep which sales order requirements should be delivered. 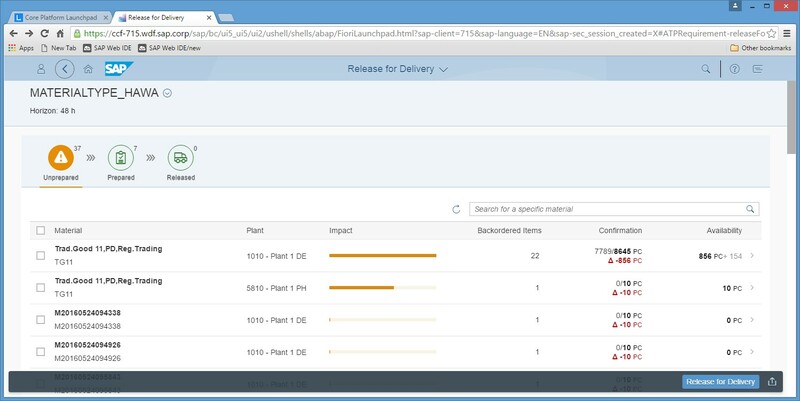 Especially designed for handling material shortage situations this highly interactive SAP Fiori app enables any user to efficiently distribute the available stock to the most important sales order requirements. To see the long-term vision and evolution path for the advanced available to promise in SAP S/4HANA, have a look at our roadmap on the SAP Portal. Looking forward meeting you at our next blog talking about the business view concerning the retail industry for SAP S/4HANA 1610. Sven – It is slightly disappointing to see that the “dynamic” functionalities like EDQA and ROC are not part of S/4 system. Even if the BOP is going to run faster., it is not event driven. Changes in the stock postings, receipt elements etc., had an immediate order fulfillment setup in gATP which is missing in the roadmap of S/4 system. There are many customers (specially CPG customers) who would miss this great functionality in AATP due to the amount of manual interventions that are required. The rules bases determinations are on the roadmap for the SAP S/4HANA 1709 release. You still have the possibility to co-exist the gATP from ECC and the aATP of SAP S/4HANA via a co-deployment. Thank you for the response, Christian. We look forward to the gATP equivalent functionalities as part of AATP in the future releases. I agree, the 1610 brought some new applications. Does aATP BOP support the ATO process with Sales Order – Production order and if not is it in the pipeline? It is not clear that aATP included capacity of resources and components availability, can you clarify on this? Can you please give more details on ATP. AATP is really disappointing 🙁 This looks like a half baked solution provided by product manager without knowing existing functionalities provided by APO. Customers from all domains like CPG, IS-MILL, Chemicals , High Tech etc will hesitate to implement AATP since it is devoid of so many factors like scenarios of create , change Rules based product or locations substitution, MISL, interchangeability, consolidation location. Every customer has done some enhancement in these areas to fulfill their business needs. Where is CTP ? MLATP ? where are the ATP categories (many customers have done enhancements around these categories) ? 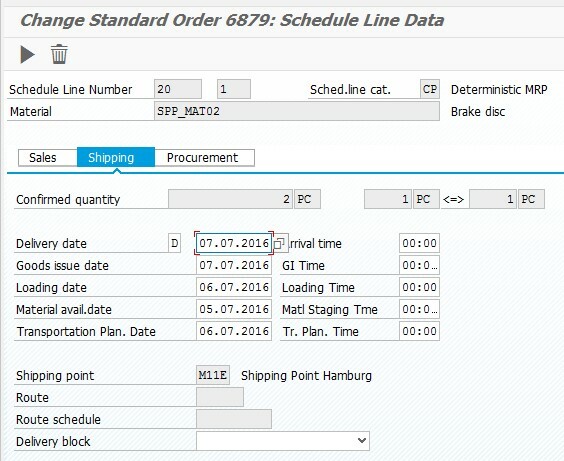 Where is the condition technique for shipment scheduling or configurable process scheduling ? or dynamic route determination ? The only new function available in BOP areas as described below can be achieved using enhancements in APO also. REDISTRIBUTE: Redistribute should gain, but may also lose. FILL: Delete confirmation, if required shall not gain anything, should keep confirmation, but may also lose. This shows lack of connect between prevailing functionality and new solution. Sorry for being sarcastic & whining but AATP needs lot of improvement.